Braille Games is a daylong event that gives blind children the opportunity to focus on development of their braille skills, which are essential for independence and self-sufficiency. Students from throughout Southeastern Wisconsin attend this signature event. 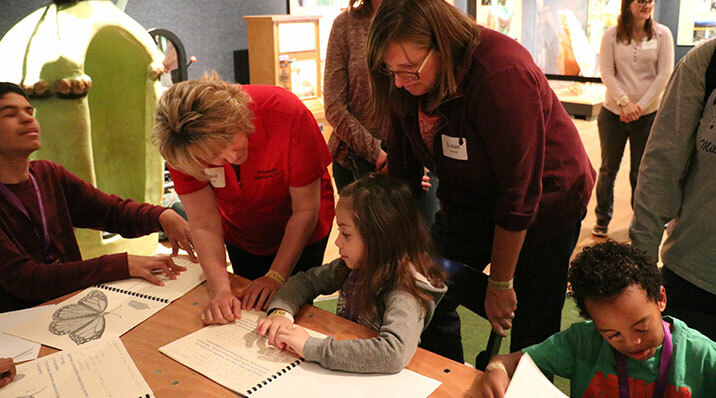 Braille Games is a wonderful example of our powerful collaborative work with the Milwaukee Public Museum, Vision Forward, the Wisconsin Talking Book and Braille Library, Milwaukee Public Schools, and other area school districts. Together, we create a unique experience that gives blind children pride in their growing braille skills. Employees from Industries for the Blind and Beyond Vision—along with other blind role models from the community—serve as mentors and role models for young braille users, illustrating the use of braille in everyday life. Mark your calendar for the 2018 Braille Games. The event will again be hosted at the Milwaukee Public Museum on Thursday, March 15, 2018. We hope you’ll join us! Support our collaborative work with a donation to ABLE.